I always wonder just what people believed and assumed in years past, most specifically in hundreds of years past. 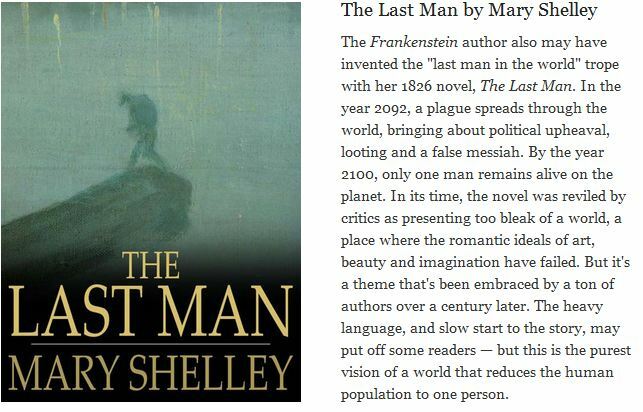 And these quotes by Mary Shelley from The Last Man, one of the earliest science fiction novels, give me insight that there are always astute individuals in every age. Centering around a plague that makes its deadly way to England, the few people left are torn between the calm, caring, patient leader who has brought them across the ocean in search of salvation, and the evil power-hungry charlatan who threatens eternal damnation and preaches that sickness is God’s punishment. So relevant to our time! (Donald Trump running for president) I guess some things never change.